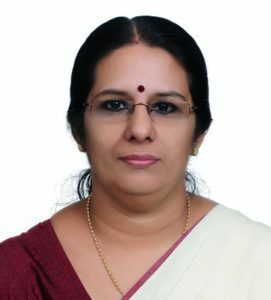 Dr. Suja Kurup P.L. is currently an Associate Professor at the Institute of English, University of Kerala and Director, Centre for Australian Studies, University of Kerala. Before joining the Institute of English, she had been working as Associate Professor at the Research Centre and Department of English. Fatima Mata National College, Kollam. She has 23 years of teaching experience and her areas of interest include Australian Studies, Eco aesthetics and American Poetry. Member, Board of Studies (Pass) , University of Kerala; Member of the Board of Adjudicators, for PhD at M.G University and M.S University, Tamil Nadu; Member of the Board of Examiners (PG), University of Kerala from 2009 to 2011; Member, Board of Studies in English, Scott Christian College(Autonomous), MS University; Co-ordinator, UGC Extension Activity on Communicative English for Rural Students at Govt. College, Nedumangad, August 2013 –March 2014; Content Writer for the e-paathsala Programme of the UGC in collaboration with MHRD in March 2015. Research Guide in English Language and Literature, University of Kerala, with two Research Scholars awarded their PhD, seven scholars working towards their PhD degree and ten students have been awarded MPhil degrees; Published 25 Research Articles in reputed Journals including The Journal of Earth Science and Engineering, Chicago; Presented 17 papers at International Conferences, including one at Colombo, Sri Lanka and 35 papers at National Conferences, apart from 9 Invited Lectures on Australian Studies; Organised five National Seminars and served as Resource Person and chaired many sessions at International and National Conferences. She is the Joint Secretary of FSLE-India for the Southern Region of Kerala.